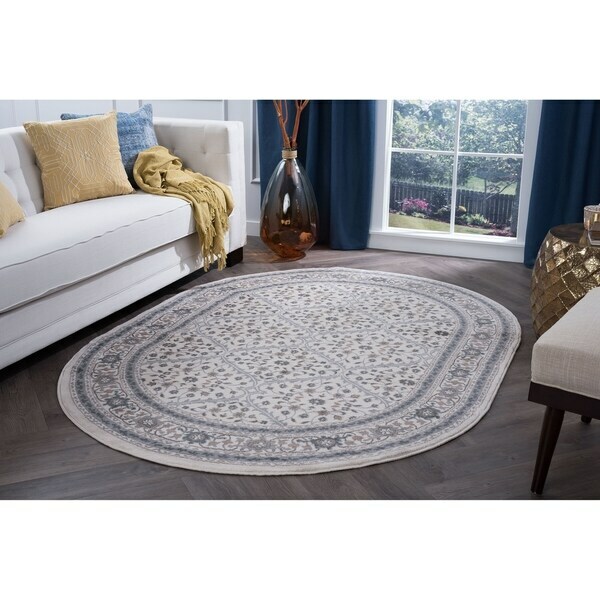 The Oval Area Rug that I purchased from Overstock is perfect for my Living Room. I have an oval coffee table and an oval rug was difficult to find but I looked on Overstock.com and I found exactly what I was looking for. I would recommend this rug very highly. Inspired by centuries of decorative stylings and tradition, this rug can bring a luxurious sense of definition to any environment. The oriental pattern precisely woven within the fibers exert a soothing aura of defined vibrancy and color within the surroundings. The durability of this rug is not easily challenged, as it has been constructed using durable stain-resistant Polypropylene fibers woven within a natural Jute backing. Vacuum on high pile setting; spot clean with mild detergent and water when necessary. Do not bleach. The rug is very pretty, but the rug is thinner than I wanted. It matches all the colors that I have in place. I hope it holds up under traffic. "Do you have size 3"*5""